The Grand Ethiopian Renaissance Dam (GERD) topped the priorities of both Foreign Minister Sameh Shoukri’s visit to Addis Ababa and his Sudanese counterpart’s visit to Cairo this week. On Monday, Shoukri and Intelligence Chief Abbas Kamel headed to Addis Ababa carrying a verbal message from President Abdel-Fattah Al-Sisi to Ethiopian Prime Minister Abiy Ahmed. “During their meeting with Ahmed the officials discussed the development of tripartite negotiations on the dam in light of efforts to implement the 2015 Declaration of Principles and the outcome of the last nine-party meeting held in Addis Ababa in May 2018,” Foreign Ministry Spokesman Ahmed Abu Zeid said on Tuesday. The meeting also discussed ways of pushing forward negotiations and removing any obstacles in the way of reaching a settlement that protects Ethiopian interests and Egypt water security, according to Abu Zeid. The meeting also laid the groundwork for the expected encounter between Al-Sisi and Ahmed on the sidelines of China/Africa Forum in Beijing next month. “These continuous meetings keep the dialogue open and contribute to resolving pending issues,” said a diplomat who preferred to remain anonymous. The Shoukri-Kamel visit came two days after the Ethiopian prime minister announced a possible delay in the construction of the dam. Commentators say any construction delays will provide Cairo with more time to negotiate pending issues related to the dam’s administration. “Time is a very important factor in this issue. A delay in the building process can give Cairo more time to resolve outstanding issues,” said the diplomat. The dam also topped the agenda of Shoukri’s meeting with his Sudanese counterpart Al-Dardiri Mohamed Ahmed in Cairo. Their meeting was followed by a preparatory meeting to plan for the joint supreme committee expected to convene soon in Cairo. Egypt and Sudan have taken part in various high-level meetings this year that have contributed to enhancing bilateral relations and boosting cooperation. During a visit to Sudan last month President Al-Sisi said Egyptian-Sudanese relations were as eternal as the River Nile. He discussed bilateral ties with his Sudanese counterpart Omar Al-Bashir and agreed to strengthen ties and work towards boosting trade, military and energy cooperation. 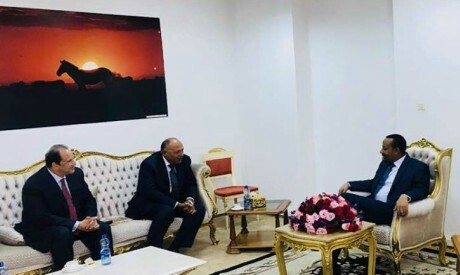 A quadrilateral meeting between Shoukri, his then Sudanese counterpart Ibrahim Al-Ghandour and the heads of the Egyptian and Sudanese security and intelligence services, was held in Cairo earlier this year. The two countries issued a joint statement at the end of the meeting saying they had agreed on 11 points that will establish a framework for cooperation between the two states. On Nile water the statement emphasised the importance of cooperation and coordination between the two countries within the framework of continuing commitment to agreements signed between them, including the 1959 agreement. The 1959 agreement gives Egypt right to 55.5 billion cubic metres of Nile water a year and Sudan right to 18.5 billion cubic metres. Ethiopia has refused to acknowledge the water quotas. The meeting contributed to easing tensions between Cairo and Khartoum, including over the disputed territory of Halayeb and Shalatin. The media in both countries has contributed to escalating tensions which reached a climax when Sudan recalled its ambassador to Egypt in January without explanation. He returned two months later. Sudan, which supports the Ethiopian dam project, has said it is also keen on preserving Egypt’s interests in receiving its share of Nile water. Ethiopia began construction of the dam in May 2011. Cairo has repeatedly expressed concern that the dam could reduce its much needed quota of 55.5 billion cubic metres. Negotiations between the three countries were suspended for three years but resumed in 2014 after Al-Sisi came to power and the Declaration of Principles was signed in March 2015. The declaration states that no country should cause harm to the others and that the filling of the dam’s reservoir should be subject to the approval of both Egypt and Sudan. The filling issue, together with protocols for the operation of the dam, continue to impede any agreement between the three countries. Egypt has demanded the timetable for the filling of the reservoir be a minimum of seven years so as not to affect the flow of water to the downstream countries. Two nine-party meetings were held this year to resolve the differences and fix a date for starting the studies that will assess the impacts of the dam on Egypt and Sudan. The second nine-party meeting was held in Addis Ababa in May and concluded with a timetable being set to resolve pending issues. “We have charted a roadmap that, if successful, will be able to break through the difficulties that we have been facing,” Shoukri told reporters after the meeting. A ministerial meeting due to be held back-to-back with the third nine-party meeting on 19 June failed to materialise. A scientific group has also been mandated to discuss and develop scenarios relating to the filling of the reservoir and the dam’s operation rules. The group has held four meetings so far behind closed doors. It is comprised of 15 members, five from each country. When completed GERD will be the largest in Africa, with a reservoir capacity of 74 billion cubic metres.